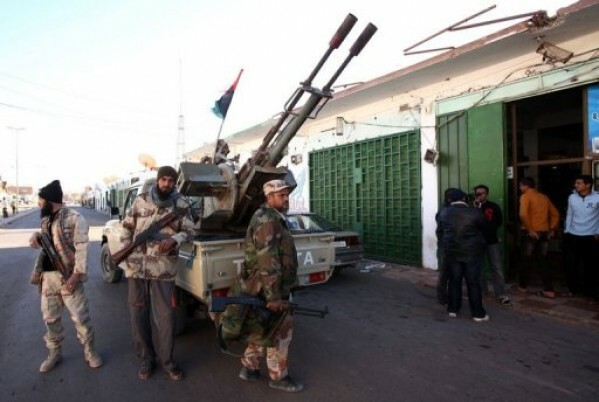 « Libya: 4 killed in tribal clashes » is AFP headline on August 24, 2013. I know Zawiya (or Zauiyah), in the western suburbs of Greater Tripoli. I hold there the Sixth Congress of the MEDD-RCM, in early February 2011, a few days before the events that destroyed the prosperous Jamahiriya. The last RCM forum and of former Libya. Zawiya was a cheerful and modern city of 150,000 inhabitants. A peaceful municipality expanding. But also a stronghold of Islamists in some neighborhoods, tolerated in the conflict between the statist socialists and the liberals, who, exactly, repeatedly were allies of these Islamists. Announcing the future configuration of the NTC in Benghazi. Here are now the media of NATO, which are forced to reveal the reality of this somaliazation of Libya. « Clashes erupted Thursday evening between members of the Ouerchefana tribe and inhabitants of the city of Zauiyah (west of Tripoli) resulting in four dead and several wounded, » said Saturday night Libyan puppet Prime Minister Ali Zeidan. « The clashes between the Ouerchefana tribe and the City of Zauiyah resulted in four dead and several wounded and fighting is still ongoing, » said Mr. Zeidan in a press statement. Note that the grid of tribal reading – see the end of this introduction – does not explain the situation in Libya. And during the Gaddafi years (1969-2011), Libya was developed and urbanized. An educated urban population had distanced itself from the tribes. And today this distance led to clashes between citizens and gangs and militias from tribes revitalized by the puppet NATO government policy and also the influence of Islamist factions. It is not only the leadership of Colonel Gaddafi that united the components of the Libyan society. But also the institutions of the Jamahiriya and its direct democracy. And also economic prosperity, social welfare, civil peace. The NATO war of aggression put a stop to it. Poverty, economic disaster, the total collapse of the Jamahiriyan institutions and central government, including the Army, insecurity and violence, all this has led to violence and vigilante justice. Libya today is a chaotic Farwest without sheriff. According to Ali Zeidan, « contacts have been established by the President of the General National Congress (GNC), the highest political and legislative authority in the country – which usurps the name of the General People’s Congress, the central institution of direct democracy under Gaddafi – Nouri Abousahmein, the Minister of Defence and the Chief of the military Staff with both parties’, which led to the sending of army troops to intervene between the belligerents « We hope. both sides to stop the fighting so that such an interposition force can be deployed on the ground, « said Ali Zeidan who lamented about “the easiness of the use of arms by citizens (…) whatever the reasons « (sic). Several sources have told AFP that « the conflict broke out Thursday night when a Ouerchefana armed group attacked a medical center near Zauiyah, killing two people and abducting another. Zauiyah gunmen went into the stronghold of the Ouerchefana tribe to release the kidnapped man and apprehend the attackers, which inflamed the situation, » say these sources. Since the fall of the Jamahiriya in October 2011, several deadly clashes took place between tribes, particularly in the south and west of Libya, due to various historical quarrels or for the control of smuggling on the border. Which has made ​​its appearance since 2011, further amplified by the traffic of radical Islamist groups from the Sahel. For which the Libyan desert has become an area of withdrawal. The analysis of the AFP – that confirms mine with one year delay – is clear: « The abundance of weapons in circulation and the existence of poorly controlled stocks, coupled with the inability of the new authorities to form an army and police forces able to impose order in the country, have contributed to the resurgence of violence in Libya in recent days”. Since the invasion and occupation of Libya in 2011, a lot of nonsense was written on the Jamahiriya. Reduced, to justify Western aggression, to a non-state based on tribal bases. It is confusing the result of the invasion of NATO and the Somaliazation of Libya with the regime set up by Gaddafi from 1969 to 2011. The ideological bases of the Jamahiriya, of the institutions of the Libyan Direct Democracy, they are not as wrote in 1985 the magazine GEO « Marx and Allah. » But there, we are already far away from the tribalized non-state of the NATO media! These bases, that’s the French Jacobinism. That revolutionary of Robespierre and the First Paris Commune, that of 1792-94. Libyan Direct Democracy largely mirrors the experience of Direct Democracy of the First Paris Commune (1792-1794) and the Committee of State Security . References are public and numerous to the revolutionary government of Robespierre (2). The Jamahiriya was an ideological state (3), with politics organized around an advanced experience of Direct Democracy, with meetings and discussions at all levels – from neighborhoods to the « General People’s Congress » (which replaced the Parliament) , through the 30 municipalities, the SABHIAHS – with organized political executives, the « Revolutionary Committees ». A pilot experiment followed in other countries, for example in Venezuela (4). This in addition to a socialist economy, and a protective and redistributive social state and a state-controlled economy. From all this, there is nothing left. Chaos in Libya. Which resulted chaos in the Sahel, Mali. Before that in Syria. Along the model of Somalia, exploded, divided, ruined. And if that was one of the options planned by Washington and its Zionist ally for the « Greater Middle East »? A « Greater Somalia » where U.S. imperialism in economic and financial bankruptcy, can still inexpensively dominate the trade routes and plunder the resources … This is my analysis from the premise of the so-called « Arab Spring ». Unlike most, I have seen it happen and announced it from Tripoli precisely (5), and long before (6). Chaos as the future for Libya and not an impossible « liberal democracy », chaos and « Somaliazation » both as a means and a goal! (2) The role played by Muammar Gaddafi in the Libyan institutional system corresponded closely – what nobody seemed to see – to that ROBESPIERRE played between the Commune and its sections, the Convention, the people of Paris, the Club of the Jacobins and the Committee of State Security. Both inspiring and ideologue, spokesman and supreme arbiter. (3) Luc MICHEL, PENSER EN CONTINENTS ! POUR UNE PHILOSOPHIE DE L’ACTION ! POUR UNE MISE EN ACTION DE LA PHILOSOPHIE : CHANGEONS LE MONDE ! (THINKING IN CONTINENTS! FOR A PHILOSOPHY OF ACTION! A CALL FOR ACTION OF PHILOSOPHY: CHANGE THE WORLD! ), Speech on behalf of the Delegations of the European Continent, the Opening Meeting of the First World Assembly of the « International Association of Supporters of the Green Book » (ASIPALV), Tripoli , Libya, October 25, 2009. (4) Interview of Luc MICHEL (in French and Arabic) on the international Radio “LA VOIX DE L’AFRIQUE”, Tripoli, Libya, March 1st 2007. PCN-TV / February 6, 2011: LUC MICHEL ANNOUNCES FROM TRIPOLI THE WESTERN AGGRESSION AGAINST SYRIA AND LIBYA! THE AMERICANO-ZIONIST AGGRESSION IS A IDEOLOGICAL WAR AGAINST THE ARAB NATIONALISM : AFTER BAGHDAD, DAMASCUS AND TRIPOLI ARE ON THE FRONT LINE ! This entry was posted in * English, * LM/ Geopolitics/ Libya, * LM/ Leaders & analyzes 1983-2013. Bookmark the permalink.